With multiple explosions taking centre-stage in the world arena posing a terrorist threat globally, a suicide jacket that surfaced amongst other explosives in Chavakachcheri last Wednesday (30) was creating a political conundrum here in Sri Lanka. While the Opposition was hell-bent on pointing a finger at the government for taking national security lightly and jeopardizing the same, much drama has been created by statements made by various politicians in the immediate aftermath of the incident. Minister of External Affairs, of the Mahinda Rajapaksa regime, Prof. G.L. Peiris ended up yesterday at the Criminal Investigations Department (CID) for his remarks on the suicide jacket found in Chavakachcheri. Following the discovery Prof. Peiris said at a media conference that the explosives and the suicide jacket were to be sent to Wellawatte. He also stated that he was certain that there was sufficient evidence to prove this claim. He was questioned by the CID with regard to this. 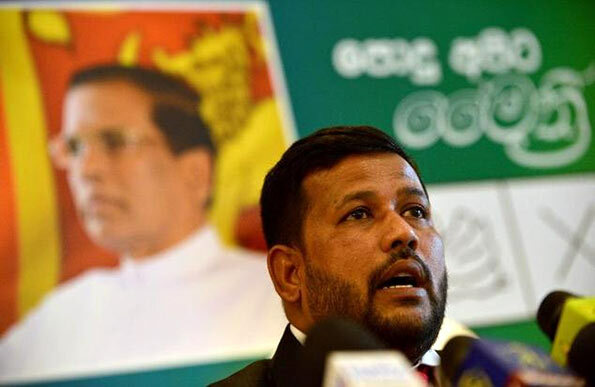 While Prof. Peiris said the explosives were meant to be trafficked to Wellawatte, Northern Governor Reginald Cooray was also caught in a foot in mouth situation for saying the explosives may have been brought in targeting President Maithripala Sirisena. Prof. Pieris further noted that Prime Minister Ranil Wickremesinghe was not in the least concerned about the worrying status of the country and added that he is frivolously dismissive of the gravity of the current situation of the country. “The economy has completely collapsed. The national security has been compromised, for him everything is a comedic act. When the Governor of the North raises concern about the risk to the President’s life, the Prime Minister has more facetious concerns. He queries whether I know the difference between explosives and fireworks. Is this how a Prime minister should behave? This is a joke and an insult to the dignity of the Premiership. Perhaps, I may not know about bombs, but there are particles of a bomb which exploded in 1999 still in my lungs. The government keeps wasting their time without commencing credible investigations on this. However, those who should be questioned are overlooked,” he said. Even though Prof. Peiris claimed the newspapers used to wrap the suicide jacket were ‘not that’ old, Premier Wickremesinghe recently said that those newspapers were of 2008, a year before the war came to an end. Meanwhile, the Defence Secretary Eng. Karunasena Hettiarachchi said his statement regarding the discovery of the arms cache in Chavakachcheri has been ‘badly misinterpreted’ and that he had no intention to dilute this particular incident but only to prevent the general public from being driven to a panic situation. “And also save the people from those who can make use of this situation to achieve their own agendas,” Hettiarachchi said. Issuing a media release he said, it was never intended to discourage our own defence officials from carrying out their legitimate duties unhindered by public opinion that may be right or wrong. “However, the security forces and all intelligence wings wish to give a categorical assurance that they are on full alert and it is also noteworthy to remind that revelation of media reports, some with vital and sensitive information, often tend to become counter productive and could jeopardize the effort to identify such activities,” Hettiarachchi said. The Defence Secretary said that unlike other public servants, he cannot disclose to the public everything that is being done in the defence atmosphere. “My position is different to the position of Secretary to any other ministry where transparency is essential. However, the matter was taken up at the weekly Cabinet meeting for discussion and both President Sirisena and Prime Minister Wickremesinghe accused certain media institutions for continuously attempting to tarnish the government’s image. “Recently Lankadeepa reported a wrong news about my being embarrassed as a result of a power failure experienced at an official function. I have noticed that certain media institutions are only targeting where we could be the wrong party and nothing else,” he said. PM Wickremesinghe joining the conversation said, now it has become a real nuisance that some media outlets are running wrong reports. “I have appointed a committee headed by Mass Media Minister Gayantha Karunathilake to look into these. Some of these people run wrong reports just to increase their circulation,” the Premier said. Finance Minister Ravi Karunanayake presented the list of Parliamentarians who have acquired liquor licences, to the Cabinet of Ministers, as he had promised previously. He informed that there are several relatives and next of kin of parliamentarians who have obtained liquor permits as well. President Sirisena directed Minister Karunanayake to provide a comprehensive list with all the details of who’s who in possession of bar permits. According to reports there are 10 parliamentarians of the government who have obtained liquor permits while 30 Opposition members have obtained those. In total 1,168 liquor permits have been issued for current and former parliamentarians. A powerful politician of the Rajapaksa regime who is facing various grave crime allegations was to be arrested by last Thursday, yet the whole hullabaloo of the Chavakachcheri suicide jacket and explosives seemed to have stalled the matter. While it is not confirmed as yet, whether this arrest would be made at a time, focus of the entire country was at a suicide jacket and a haul of explosions found at Chavakachcheri is still a mystery. Several Cabinet Ministers expressed the view that the arrest would be made after the Sinhala and Hindu New Year ending long-prevailed hide and seek game between law enforcing institutions and the politician. This, however, is expected to create a series of political dramas between the government and the Opposition. Minister of Trade and Commerce Rishad Bathiudeen who has a knack to end up in controversy, be it stoning the Mannar Magistrate or deforestation in Wilpattu, seems to be in another controversy as he locked horns with Prima Ceylon Limited over increasing wheat flour prices, attributing it to the increase of the import levy on wheat grain. The price of a kilogramme of Prima wheat flour has been increased with effect from 12 March 2016. Accordingly, the price of a kilogramme of Prima flour will be increased by Rs 7.20. The new price of a kilogramme of Prima flour will be Rs 97.20. However, this move seemed to have soured the relations between Minister Bathiudeen and the Company as the minister claimed the Company increased the prices without having any consultation with the government. According to reports, an issue was created with Serendib Flour Mills Sri Lanka lobbying to increase their price as well, which was not being permitted by the Consumer Affairs Authority or the Cabinet Sub Committee on Cost of Living as wheat flour is considered an essential item. With Prima Company being ignorant of the Minister’s pleas to bring down prices, angry Minister Bathiudeen has allegedly had his officials to raid Prima’s wheat flour mill in Trincomalee. However, this incident was reported to Prime Minister Wickremesinghe who at the weekly Cabinet meeting reprimanded Minister Bathuideen for his arbitrary act. When contacted, China Bay Police in Trincomalee confirmed they had in fact received a complaint on 17 March 2016 from A.A. Jasoor, Assistant Director of Consumer Affairs Authority, alleging that he was obstructed from entering the wheat flour mill of the Prima Company. The complaint stated that when he went to inspect stocks of wheat flour at the mill he was not given access by Kithisiri Jayatissa, the District Manager, who was on duty on that day. According to the complaint the District Manager on duty had informed Jasoor, after having communicated with the Colombo Head Office that he needs a Court Order to carryout investigations. Jasoor who claimed he was made to wait from morning till 1:00p.m. at the mill premises had lodged a complaint with China Bay Police. The OIC of the police had recorded a statement from Prima District Manager who was on duty and is said to be carrying out further investigations on the matter after making Trincomalee DIG aware of the matter. Prima Ceylon Ltd, Sri Lanka’s dominant household multinational brand, has earned praise for its role in contributing to our export revenues meet 80% of Sri Lanka’s domestic demand for wheat flour. And more importantly, Prima also does significant wheat flour exports originating from their Trincomalee mills thereby contributing to Sri Lanka’s exports drive as well. It was not long ago that Minister Bathiudeen thanked Prima for its role in Sri Lanka’s domestic food security by maintaining strong buffer stocks. Prima wheat flour milled at the Trincomalee plant consists of almost 90% of country’s annual exports to Indonesia, which stood at US$118 million in 2011. Sri Lanka’s annual wheat flour market is estimated to be between 550,000 – 600,000 tonnes.